Slivers of wood waiting to be included in an intarsia wood inlay scene.Sorrento's greatest craft is intarsia (wood inlay)—whether artistic panels in a Classical style for the Duomo doors and choir stalls or simple post-modern patterns on jewelry boxes, tabletops, picture frames, or other souvenirs for the tourist trade. There's now a local museum devoted to the craft, the Museo Bottega della Tarsia Lignea—but why pay €8 admission to see the stuff when you can see it for free at active workshops? 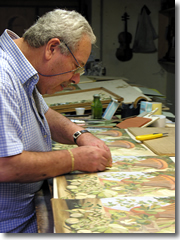 Giuseppe Rocco works on his intarsia marquetery.I visited one of the top local artisans, ★ Giuseppe Rocco, at his studio Via San Nicola 30 (tel. +39-081-878-4874, www.giusepperocco.it). He was carefully arranging delicate slivers of olive, walnut, myrtle, rose wood, orange, poplar, quilted maple, chestnut, elm, mahogany, and ebony to create woody mosaics of surpassing beauty. 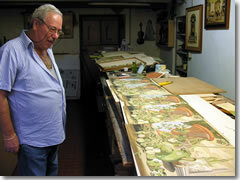 Rocco had been part of the team that made the cathedral door panels in the early 1990s, showcasing scenes of everything about Sorrento that Pope John Paul II had mentioned upon his visit. Rocco explains that His Holiness had actually been in the region to tour the delinquent-plagued city of Castellammare, but while he was down this way he "took a little tourist spin to Sorrento and Capri." "We have nothing important here," Rocco says, setting aside his work for a few minutes to chat. "Just a beautiful setting and hard-working people." He goes on, proud of his work on the papal doors. "We could have made doors in bronze to commemorate his visit," he says. "But we decided to make use of this local craft, which we been doing for more than 200 years." 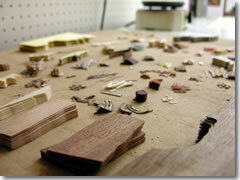 He gestures to the intricate wooden mosaic half-finished on the table. "I hate it when people say 'Oh, it must take so much patience.' That means they're just looking at the manual labor of it. There's so much more to this. It's an art as well as artisanship." Rocco pauses to pick up a handful of carefully shaped wooden slivers in various colors. "They just see me sticking little pieces of wood. But it's the design, the scene, the care that I put in." Rocco explains that he was a painter before taking up intarsia in the late 1970s. "The design, the image, and the composition are all more important than the craft." An example of Giuseppe Rocco's more artistic work (This one inspired by 19th century Grand Tour paintings).I gesture at finished works scattered around the studio. "I like how all your scenes are complex," I say. "Real scenes with delicate leaves and little lizards hiding in corners. Most of what I see around town are small, simple images of abstract, blocky houses and seascapes." He smiles at me and holds up a finger. "Ah, but make no mistake: there are two kinds of craft in town. Those that you see in all the shops, those are made for commercial purposes, made quickly and cheaply for a tourist market that wants cheap, quick souvenirs." "Then there is this," Rocco gestures at the scenes he has been working on, a still-life of sorts with fruits, vegetables, and vases in the foreground left, and a faraway landscape spilling back of broken columns on checkerboard fields, a shoreline, and a distant island. He titled it "Metaphysical Suggestion." "This is intarsia," says the maestro. "This is art. Those others make what tourists want. I make what I want. I don't do 20, 30, 50 identical copies at a time. I do, at most, six—like here." He pauses to straighten out the nearly-finished panels before him and seems to relax a bit from his hard-nosed philosophical line. He smiles. "Sure, I do commissions. I do what's wanted—art is art, but a man must also eat!" Giuseppe Rocco examines his handiwork. "I can do this," he points at a tall, monochromatic sea stack of caves and dripping vegetation—Mediterranean details on a Southeast Asian scene—suspended in a field of royal blue. "And if nobody else likes it or buys it, well, then I've still made something that I wanted to make." I explain that I understood his point of view, that, as a journalist, I write for others what others want to make a living, but I still try to find time to write for my own fulfillment. Eventually I excused myself. "I'm going to go find a bar or cafe to sit down and write for myself a little while." 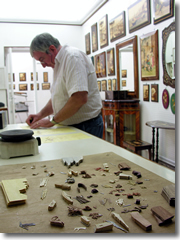 A Stinga at work in his studio. For the design of the cathedral doors, Giuseppe Rocco worked with the Stinga clan, which have been the first family of Sorrento intarsia since 1890. Brothers Roberto and Franco Stinga are the third generation to make Stinga Tarsia (Via L. De Maio 16, tel. 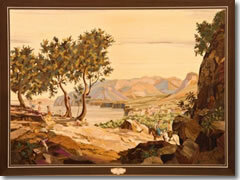 +39-081-878-1130, www.stingatarsia.com) one of the top artisan shops in Sorrento for marquetry. The Via L. De Maio address is the shop/display room, but I like to stop by their actual studio at Via degli Aranci 102 to watch the masters at work. "It's a family business," shrugs one of the brothers—with gray hair and a weary look, a bulbous nose sprouting several hairy boils—as he slowly pieces together a trio of identical scenes. Like 60% of the intarsia works around town, it is a typical Sorrento seascape, showing with trees and a tumble of rectilinear houses atop a curving coastline. I tell him I had seen his name on the Cathedral doors, which were very beautiful. "Eh, si. Those... those are belli," he says, going on to explain that the panels on the Duomo doors summed up the entire history of Sorrento, ending with a visit by John Paul II in 1992. "This was a papal town, too, in a way," he glances at me over his spectacles and gestures as if tossing something over his shoulder a few times. "Way back, though." Then the maestro returns to tediously mosaicking his trio of 10" x 6" landscapes, each of which would sell for a mere €25. 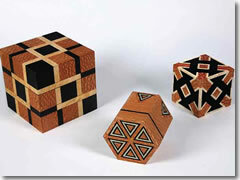 Many intarsia artists in town, like the Stinga, now do souvenir pieces in modern, bold patterns.The woman manning an intarsia shop on Corso Italia explained the surprisingly cheap prices for wood inlay. "We keep is low so people will buy. We do it so the artisans won't disappear." She gestured around her little shop. "Tourists won't spend more, and if the works don't sell, young people won't go into the craft." She shook her head. "Too many traditions die out." Then the shopkeep suddenly switched on a smile to welcome a pair of young American women off the sidewalk. They had been in the shop yesterday and now wanted advice on where to have dinner. I hoped they bought something.